BALIF and Jones Day welcome all summer associates, law students, attorneys, judges, staff, and friends from all around the Bay Area to their 3rd annual Pride Breakfast celebration. Come and enjoy great food, drinks, hosted bar and an amazing view of the Bay at this annual event before you head out to watch the Pride Parade. 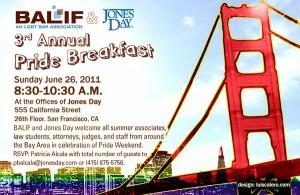 Please RSVP to Patricia Alcala with total number of guest at pbalcala@jonesday.com or (415) 875-5756. If you have questions, please contact BALIF’s social co-chairs Lilah Sutphen and Ryan Lowther at social@balif.org.